What are the real questions facing parents? Author Annie Fox just wrote, Teaching Kids to Be Good People, and she joins us on her global “blog tour.” She was interviewed by Sue McNamara, Six Seconds’ Education Director in Singapore. Please continue the discussion by adding your questions for Annie and Sue in the comments! Q: Some parents say it seems like it takes so much time to be a ‘good parent’, to get it just right, to be the perfect parent! 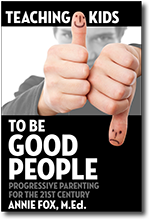 What would you say above all is the principal ingredient for parents in ‘Teaching Kids to be Good People’? There are no “perfect” humans, parent or otherwise. So you don’t need to worry about that! The principal ingredient for parents in Teaching Kids to Be Good People is to be ever mindful of how “goodness” manifests itself in behavior. If it’s my goal to teach my children to be generous of spirit, helpful, willing to take another person’s point of view, and have the social courage to do the right thing (despite pressure to do otherwise) then not only must I myself “walk the walk” in my own life, I must also look for opportunities to engage my children in the lessons of goodness. That means having conversations that count around issues of ethics, compassion, etc. I must also commit to staying connected with them, as a good mentor would, to keep them grounded in these core values and to provide tools for them to navigate the tricky waters of peers relationships. Q: Many parents comment that it is easy to parent ‘good’ kids in becoming ‘good people’ but we know that children come in many shapes and forms. What’s a good place for parents begin their journey in ‘Teaching Kids to be Good People’? Ideally the journey begins when your child is born, but that’s not the only beginning. Parents can hop on the bus whenever they realize (or remember) that they ARE their children’s most influential teacher.If you’re kids are generally cooperative and toe the line at home and at school, you may not feel the need to think about the Bigger Picture of teaching them to be “good people.” But when kids seem to push back against the rules, for whatever reason, (and there are many reasons this happens) then parents may scratch there heads in bewilderment. They may think, “Woah! Our kid is going down the wrong road. We’ve got to do something!” Their anger, disappointment, embarrassment at the child’s behavior may cause them to panic. This can result in their coming down very heavily on the chid. That’s just going to make things more stressful at home. A good place for parents to begin their journey in teaching kids to be good people is to acknowledge where they themselves have missed the mark in parenting. If, for example, you say you want to teach your child to treat others with respect, and yet you have consistently allowed your child to speak to you (and to his/her siblings) disrespectfully, then you have missed many opportunities to teach about respect. The same is true if you have consistently treated your child disrespectfully. How can a child learn respectful behavior in that environment? S/he can’t! So the place to begin is to get clear about what are your long term parenting objectives for your child? By the time your child is 18 years old, what life skills/character traits do I want to see him or her develop? Start there and make a plan that will allow you to reinforce those character traits vs. undermine them. Q: Many parents of teenagers ask, is it too late for my child to change their behaviours? We know, at Six Seconds, that humans are capable of creating change in their lives, no matter what age. What practical advice would you offer to parents of teenagers who may feel it is too late to positively influence the behaviours of their children? I agree. We are always capable of creating change in our lives. Parents of teens have only a few years left of “under the same roof” parenting. But even if they were moving out tomorrow, it would still not be “too late” to have a positive influence on them. It’s never too late to show that you care and that you stand strong in your determination to be a guide and mentor to your soon to be young adult child. Practically speaking, we need to continue to talk with our teens. (And texting is not the same as having a conversation!) 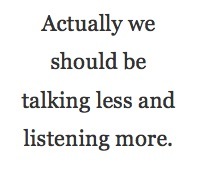 Actually we should be talking less and listening more. When we listen with an open heart and an open mind, we can better understand the young adult our son/daughter is becoming. We can also better understand where the gaps exist in our teen’s social and emotional development. By listening well and by being a “safe” person to talk to (vs. a hypercritical parent) our teens are more likely to come to us for support, guidance, and an opportunity to share their challenges and triumphs. That’s how we stay connected. Then, when they are out in the world, they will take our values with them. Realistically, we have no control over what they do when we’re not around, but if we remain part of their support network (because we put ourselves in the heart of that network) then our voice will be in their head whenever they are faced with a tough choice. Q: Peer pressure is a huge issue, particularly for teenagers. What would you say to parents who are feeling helpless observing the ‘bad’ decisions that their children are making? What would you suggest they do to assist in re-aligning their children’s ‘moral compass’? That’s a tough one! Especially since today’s teens are mind-melded to their peers 24/7 via social media and digital devices. Their peers have a tremendous amount of influence on the behavior of our teens. That said, parents are still a teen’s #1 influencer. What I want to say to parents is this, “All teens make “bad” decisions from time to time. They are teens. They are immature. Most “bad” decisions result from ignorance. Your teen is ignorant of the effective way to manage destructive emotions (jealousy, frustration, betrayal, fear of rejection, etc.) It’s in the throes of these emotions that most “bad” decisions are made. Teens lack self-awareness and self-control. If they KNEW better then they would DO better. If your teen is consistently messing up, and doesn’t seem to be able or willing to make a course correction based on the consequences that come from their choices, then you may need professional help with a certified parenting coach and/or a family therapist. 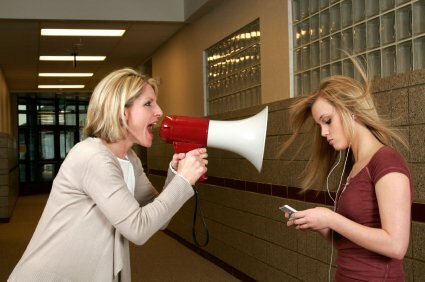 If you aren’t sure if the behavior you’re seeing is “normal” teen behavior, talk with the school counselor. Do not give up on your child?! Work with your child. Get the professional support you need and provide your child with the support s/he needs. Together you can get through this. Q: There are more and more pressures put upon parents in modern society both financially and socially. The stresses and strains of daily life have an impact on how Mothers and Fathers interact with, and parent, their children. What would you suggest may assist parents with balancing these pressures with the role of being a ‘good’ parent and guiding children in being ‘good people’? The best way I know to de-stress from the demands of 21st century parenting (and living) is to consciously choose to UNPLUG, as a family, at least once a week, and spend time together doing something that you can all enjoy. Something low-tech. Or no-tech! Something that takes you out in Nature would be great as there is a natural calming quality to be walking, biking, hiking. To use one’s senses to observe and appreciate the natural world… something we do all too infrequently in our day to day lives. We are not machines. This seems obvious and yet we push ourselves as if we believed we didn’t need to unplug…ever. But we do. We all do. We need to have fun together, parents and kids (and yes, teens too!) We need fresh air. We need to go out and play. When we do, we smile. We relax, and we increase of our ability to deal with the pressures of being a “good” parents. Answers are from Annie Fox, author of the new book: Teaching Kids to Be Good People. Serving as a kind of “online Dear Abby” for teens, Annie’s heard it all — and has learned to understand the real challenges youth and parents face. Her other books include The Teen Survival Guide to Dating & Relating, Too Stressed to Think?, the Middle School Confidential book and app series, and the Raymond and Sheila picture books series. From the questions posted below, we will choose three people to win a free eBook of Teaching Kids to be Good People. Ask a great question to enter! Thank you so much for giving me an opportunity to speak to your forum. 6Seconds has, for years, been a group I have greatly admired and respected. What an honor to be on the same EQ Team as all of you! As a parent, I struggle to get past the self-centered world of our nine year-old. How do we help her to see the bigger picture? Hi Dawn. I know, at times, it can be extremely frustrating for adults to try to co-exists peacefully with children. They are often, by definition, “immature” LOL. Which, of course, means that they don’t always take the socially responsible point of view. Yep, they can be totally self-centered! And for us parents who are particularly interested in teaching them to take other people’s feelings and concerns into consideration, it can be a huge struggle. Kids can be so caught up in Me, Myself, and I that they’re blind to anything beyond their immediate feelings. The enormity of those emotions may overwhelm to the point where they believe “I will ALWAYS feel this way!” At emotional times, a parent’s teacher-mentor role requires such grace and skill. Teaching our kids to be good people includes helping them learn to be compassionate. We can do that by acknowledging the ragged truth of their raw emotions and by teaching them resilience and courage. How do we perform that complex dance step? By helping our children see that the current emotional storm, while fierce as all get-out, shares a few things with past storms that they’ve successfully weathered. (“You got through something like this. You can do it again.”) In that compassionate reminder, there is much inspiration and encouragement. Fuel for Thought—Recall a time when you did not survive an emotional upset of your own. I’m not being facetious here. I’m simply stating the obvious (which in times of crisis can be helpful). No matter what has happened to us in the past, no matter how emotionally challenging that event (or period) was, if we are reading these words, then we have survived. Conversations That Count—Choose a calm time (after an emotional outburst or meltdown) to discuss how difficult it can be to talk rationally when someone is upset. Explain how we all go into Emergency Mode when we’re angry, frustrated, jealous, or scared. Recall a recent time when someone in the family was upset and someone else tried to have a reasonable conversation with him/her. What happened? NOTE: The point of bringing up this past event is not to blame the emotional person for having been emotional. The point is to review the incident together and calmly talk about what it was like from each of your perspectives. Teach—We all get upset at times, feel stuck, and lose the connection with our rational mind. But the most encouraging and special part about being human is our unique ability to talk about feelings. This provides us with enormous opportunity to learn and grown in the direction of Good. The next time your child loses it, let the storm run its course (provided that s/he is not physically or verbally abusing anyone or damaging property). Revisit the plan for Getting Unstuck (QT 3.1) to help your son or daughter get back to seeing the Bigger Picture. thank you annie and sue! I recently participated to a conference of an Italian professor, an educator. he told us that educating is taking care of ourselves first, as human beings, to show and not to teach our kids who we are authentically. he talked about being necessarily “distant” with the consciousness that we are alone, in a philosophical and positive way. we have to reinforce the self to be good people. and this is what we should hope for our children. Hell ilaria boffa, Thanks for sharing your insights from the conference. I’d be interested in getting the name of the Italian professor you referenced to learn more about his work. If comes to “showing” our kids who we are “authentically” vs. “teaching” our kids about authenticity.. that seems to me, to be a false choice. It’s not a question of either/or. Which is why I called my book Teaching Kids to Be Good People. Of course we need to walk the walk in our own lives, be, as you say, our authentic selves so that our children will know from our direct example how to connect and manifest from our core, authentic self. And we also do well to teach, with words and conversations that count. These discussions are a meaningful exchange of feelings and ideas. When we engage our children in these conversations AND we demonstrate authenticity in the way we live, then we have lots to talk about. And, also, lots of opportunity to learn where the gaps are in our children’s understanding of what it means to “take care” of ourselves. Especially helpful when tweens and teens feel that push/pull amongst their peers. We can help guide them as they navigate the waters of middle school and beyond. Annie, I believe in your comment about talking less and listening more to children. I also agree with those people who say that adults should model the behaviour that they want to see in their children. In the 21st century, we cannot escape technology: it is here to stay. As a middle grade teacher, I see students using their iPhones, etc. constantly. This sometimes seems like an obsession and it often carries over into the classroom. Some students have even refused to stop texting or looking at messages when I have kindly told them to put their technology away. I think that before they buy or help their child buy such a device, a parent needs to have a strong talk to his/her child about when to use it. This is where modelling comes in. When I see adults being just as disrespectful with their use of technology, then why should I be surprised that kids are, too? Hi randycoates, It’s not at all “surprising” when the child demonstrates the same behavior as the parent (with technology or not.) You bring up an important observation when you say it “sometimes seems like an obsession” and that your students have “even refused to stop texting or looking at messages” when you’ve requested that they put it away. Personally, I believe that there such a thing as connection addiction. To the degree that your students aren’t willing to put the tech away, they very well may be unable to do so. Their addiction to being connected to their peers (which is part of their peer approval addiction) makes this a compulsive behavior… not one that they have much control over. Dear 6seconds people, just wanted to let everyone know that the eBook version of Teaching Kids to Be Good People is FREE through Friday only. Here are all the links for US and many other countries! http://teachingkidstobegoodpeople.com/order Please take this gift, from me to you and the kids you care about.